Creating a practical family home from a run-down Victorian property full of partitions and dark, dingy rooms might seem like one renovation too many for most people, but for Isobel and Zac Nicholson it was the obvious thing to do. Find out how they tackled an extension, as well as a complete renovation of their home, then browse more of our real home transformations. Inspired to take on your own project? Our expert guide tells you everything you need to know in order to successfully renovate a house. We've got plenty of advice on extending a house, too. Living in a two-bedroom apartment in West London with their young children, Isobel and Zac were keen to find a project that would give them some much-needed extra space. And, after searching for six months, they eventually came across the perfect candidate: a dilapidated townhouse that had been used to house nuns from a local convent. The property’s internal layout was quirky, to say the least, with every room a few steps up or down from the last. It was clear that the whole place would benefit from a rethink. ‘We wanted to have lots of open floor space, with room for the children to play and turn cartwheels, and also needed plenty of clever storage to hide away mess. However, the obvious “open it all up” options were not going to work,’ says Isobel. She and Zac worked with architects and interior designers to devise a way of dealing with the floor levels and dark corners while making the most of every last bit of space. 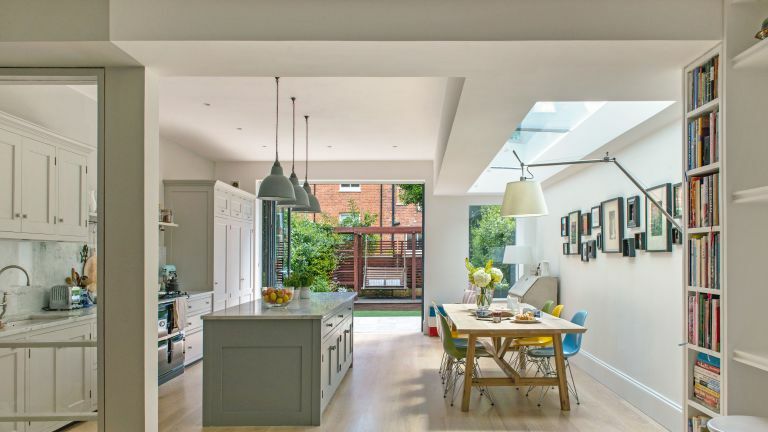 A side-return extension with a glass roof created a light-filled kitchen-diner with a play space and storage area at one end, opening onto the rear garden with bi-fold doors. An ingenious new opening with a glass balustrade links this space to the higher level front sitting room, which had previously been shut off on its own. In the basement is a new utility area and WC, while on the first and second floors there are five bedrooms, two with en suite showers, and a family bathroom. Rooflights and high-level glazing introduce plenty of daylight, and every room has extra storage. ‘What was key was to juggle the practical space with the little luxuries,’ explains Isobel. ‘We managed to get a compact master suite into the front bedroom in order to keep good-sized rooms for the girls. The work took eight months and went fairly smoothly, ‘although inevitably we ended up having to move from the flat we’d been renting before the house was quite finished, and living with the builders for the last few weeks,’ laughs Isobel. As much as the Nicholson's aimed to modernise the house, they wanted to retain its period charm, too. The existing windows were either rotten or had been replaced with inappropriate uPVC versions, so instead they fitted energy-efficient, double-glazed timber sashes. Isobel and Zac also reinstated missing or damaged cornicing and, in the living room, installed elegant double doors and a marble fireplace. In terms of style, it was a case of neither too old nor too new. ‘I’m a country girl at heart – I was born and raised on a farm,’ says Isobel. ‘I didn’t want to go too stark and modern, but at the same time we didn’t want it to feel old-fashioned. The kitchen-diner demonstrates a similar balance of styles, with a contemporary take on a farmhouse kitchen, complete with an Aga range cooker and a butler’s sink, but with marble worktops and splashbacks, and in-frame Shaker-style units. Bright red Tolix stools, vintage industrial pendants, and a station-style clock add a fashionable edge. Alongside the contemporary furnishings are a few inherited antiques, a sprinkling of vintage finds and some dramatic photographs taken by Zac. A soft, neutral palette has been used throughout, with the occasional splash of colour and pattern in wallpapers, rugs and cushions, many of them from Designers Guild, a favourite haunt of Isobel’s. Looking for more real home inspiration?